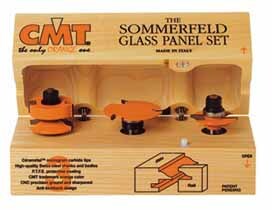 Another innovative CMT product designed by Marc Sommerfeld. This unique stile and rail set allows you to easily produce glass panel doors utilizing a rubber panel retainer to secure the glass in an 1/8�� slot that is cut into the door frames. This set works the same as our other stile and rail sets but leaves you with a square rabbet on the inside of your door for installing the glass panel. The bits are designed to machine all pieces face down. After machining the cope and pattern cuts use the 1/8� slot cutter to cut the groove for the rubber panel retainer. The edge of the pattern cut will ride on the guide bearing on the slot cutter bit (see drawing). When you cut the groove in the rails you can cut the slot the full length of the stock. When you cut the groove in the stiles you need to set up reference points to stop and start the cuts so they are hidden from view on the top and bottom of the doors. 1/2� Shanks.